I am so late in getting to this so I apologize. I haven't forgotten. Really!! This is a top ten list of my favorite things, hard to put some of them in order but not the first one! 1. My husband and son. 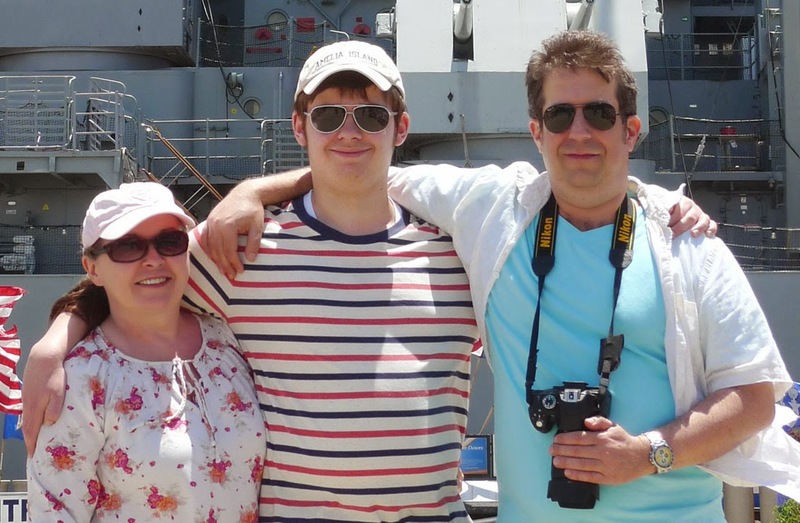 Without a doubt my two very favorite people on the planet. I know they are not "things" but they are my entire universe so they take the top spot. 2. 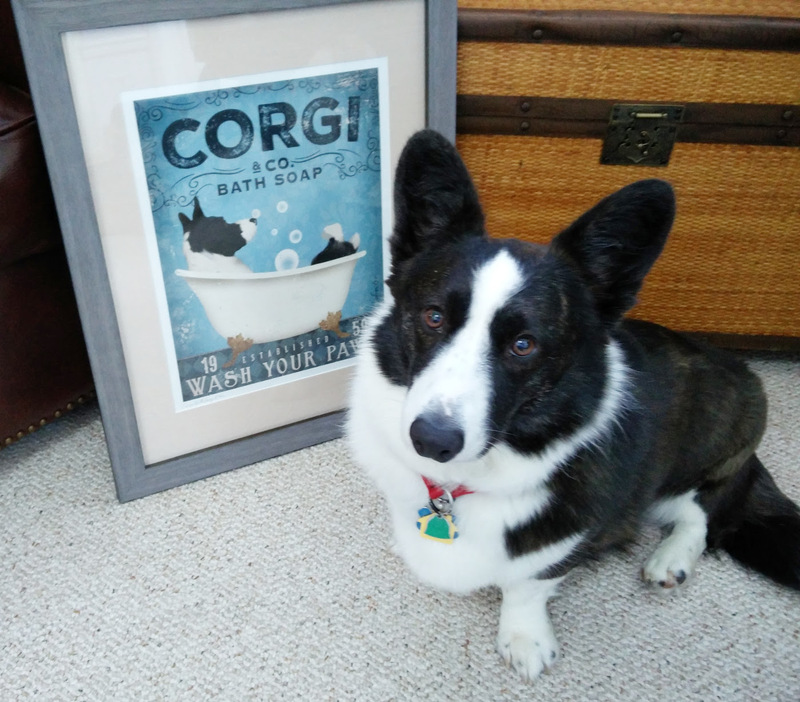 My dog Bella, an adoring little companion who thinks I am totally awesome in every way. 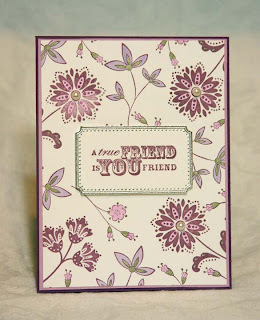 True Friend and Sweet Stems stamped in Perfect Plum (with Pale Plum and Mellow Moss accents). 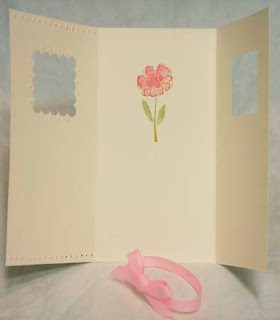 Frames With A Flourish embossed in silver and Pretties Kit pearls added to flower centers. 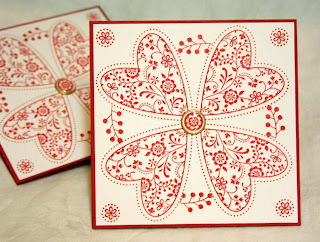 This is a card design I have done before, once in red for Valentine's and once in blue to simulate a Pennsylvania Dutch tile. This one is for St. Patrick's Day. I like the way the design makes a cross if you look at the blank spots that come together into the center. 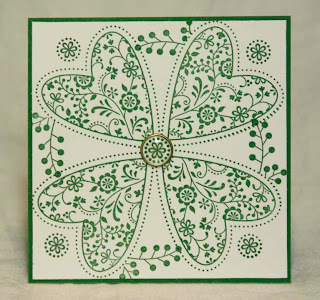 Any heart stamp will work to make a shamrock, try it out. I'm Irish all of the time but everyone can be on March 17th! Always stamps in Garden Green with a build-a-brad center. Easily done with the stamp-a-ma-irish-jig. What's better than a hug? 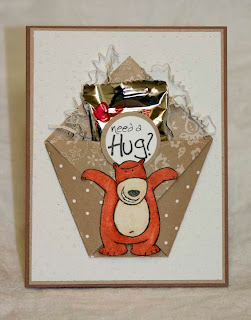 A hug that comes with chocolate,of course! This pocket pouch was made with a 6x6 piece of designer paper. Fold diagonally and then bring points into center like a diaper. Filled with chocolate and crimped paper. Bear is from Under The Stars colored in Copic markers, sentiment unknown maker. 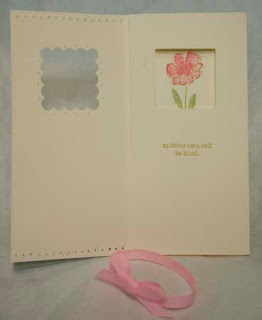 Card base is Naturals White (Swiss Dots Cuttlebug folder), Kraft, and Close To Cocoa. For today's challenge to use alcohol. I did the polished stone technique for background (Cool Caribbean and Silver) and used my Copic alcohol markers to color image. That's as much alcohol as I could get into my challenge without a cocktail (it's much too early in the day for that!). The bird and flower image was cut out with my detail scissors so it adds a little dimension to the card popped up ever so slightly. Card is Glossy White for the polished stone part and matted with Taken With Teal and Brushed Silver. 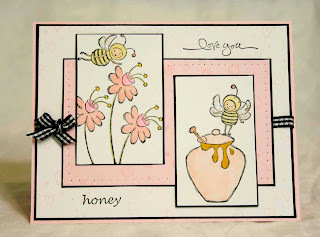 Today's sketch challenge was combined with another challenge I do with my stamping friends Sharon Graham and Julie Alberda. Julie challenged us to use our most hated SU color and for me it is Pixie Pink. I still have the whole original pack I bought when it first came out, minus a sheet or two. We would love to have you join us for our challenges, using the keyword TAWC which stands for Three Amigas Weekly Challenges. 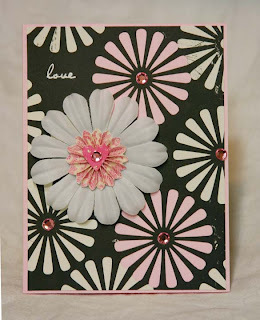 Pixie Pink, Black, and White cardstocks, markers, black brads and grosgrain ribbon. 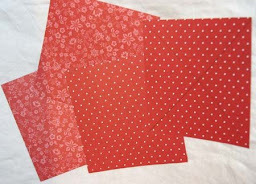 Bella Rose paper with Riding Hood Red (stamped with Posy) Chocolate Chip card base. 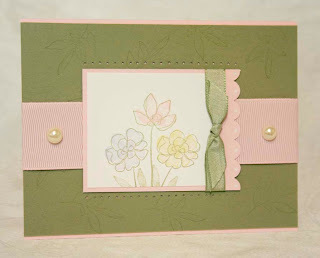 Botanical Blooms set was stamped on white textured cardstock. Scallop on bottom was from Big Shot envelope die. This is for today's challenge to use the colors Baja Breeze, Pacific Point, and Garden Green. I combined this with our Three Amigas Weekly Challenge to case something from the new catalog. 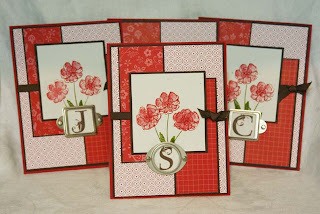 My friends Julie Alberda (Julies stamping station) and Sharon Graham (stamping with Sharon) and I will be hosting weekly challenges and would love to have you join us. There is no deadline, this is just for fun and motivation. We will be posting every Monday. Mine was the Bloomin' Beautiful card, I changed the colors and paper, all else is cased. Cut a 12"x12" paper into four 6" squares. Using a pencil, lightly make a line from corner to corner making an X on one side of the paper. 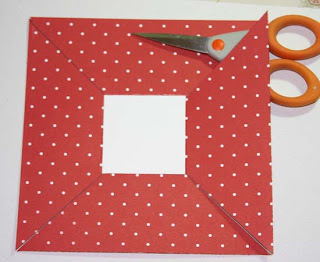 Cut a 2" square and adhere to center. Each point will line up with pencil marks to help you in positioning this directly in center. Score around white square with tip of bone folder. Cut on pencil lines to cardstock square on all sides. Add decorative edge with scallop punch if desired. Bring all side edges up and overlap slightly. Adhere. (You can make this shallow or more cup-like, however you like it). Cut a 12"x1" strip and adhere to basket inside for a handle. Embellish as desired. 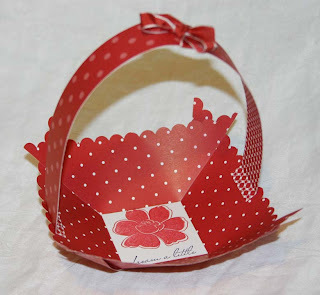 These are super simple to make and I like that one sheet of cardstock will make 4 baskets. You can assemble all of the baskets without the handles and stack them up for easy storage and complete the addition of the handle at a later date as needed. For the TLC to use pleated paper. For our DDC challenge hosted by Michelle (sf9erfan) to case a card from the old catty- I used the idea of the flowers on page 21. 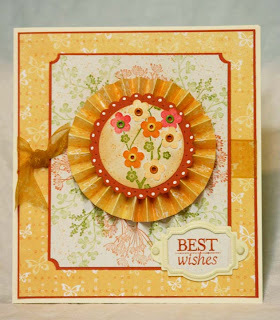 For my friend Anne's challenge to incorporate eyelets into our card design. I changed the colors papers and stamps keeping the theme and layout the same. Congratulations on your well deserved honor, Vicky!! Your gallery is inspirational. Paper retired SU with Naturals White, Really Rust. Stamps: Three For You, Eastern Blooms, Garden Silhouettes, Fresh Cuts, Cute and Curly, Itty Bitty Backgrounds. 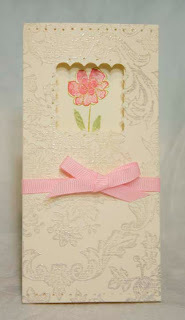 Naturals Ivory card base with Confetti Tan, and Blush Blossom that was clear embossed with Bella Toile. 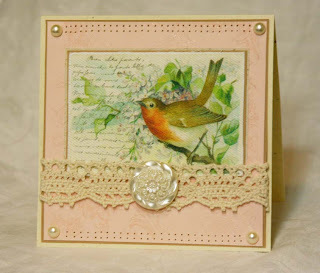 Pretties Kit pearls and Making Memories lace plus and antique button from my collection were used for embellishing. This was pretty quick and easy using the SU rub-ons (from last year's Sale-A-Bration). Always bird and heart stamped in Riding Hood Red and Pirouette Pink. Ribbon unknown. 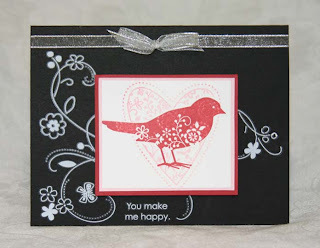 I use this set so often I keep a cut out heart and bird in with the stamp set so I can use it for masking in a hurry. 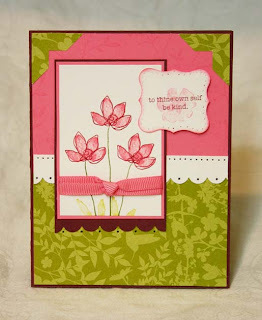 I am in a swap for new Sale-A-Bration sets and I chose Botanical Blooms. I thought I would do something different for the participants and decided on a personalized monogram for everyone (there are 8). I hope they like it. This is the third of 3 different designs for this swap. I used Riding Hood Red Pattern paper with matching card base matted with Chocolate Chip. Lovely Letters monograms set was used stamped in Basic Brown and mounted with a Styled Silver hardware frame. What do you think? This was all about the paper which did all of the work. Card base Pirouette Pink with 5th Avenue diecut designer paper that had a few rhinestone gems added to it. 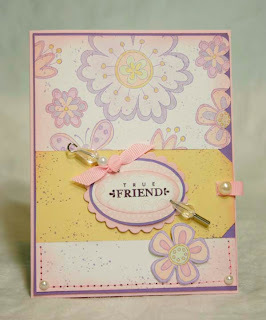 Pretties kit flower with a K&Co Smitten embellishment center. Embossed love sentiment in white (from SU Noteworthy). Quick as can be! 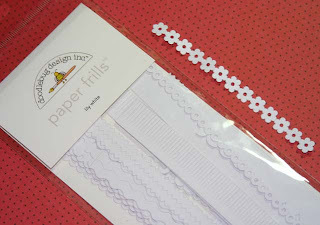 This is a really convenient product to have around and what I used to border the heart in this project (The flower strip shown). The paper strips are about 12" long and are from Doodlebug, I got these from A Muse. Riding Hood Red, Chocolate cardstocks with Bella Rose and I Wish paper. 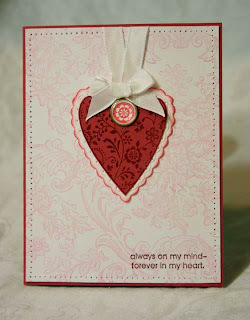 Always heart was stamped in red on Whisper White, I sponged some Pirouette and Pretty in Pink on it and added pearl. 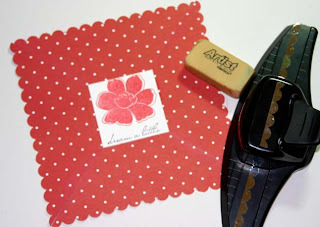 On the brown Bella Rose paper I stamped some of the images from Always in Craft White. Silver hardware for sentiment, pearls, and chocolate chip taffeta ribbon. Card base was wheeled with Doodle in chocolate. 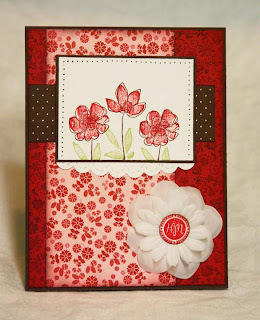 Card base is Bravo Burgundy with Regal Rose that was stamped using the Pretty Petals background in pink. Urban Garden designer paper, rose grosgrain ribbon and designer label punch also used. The new Sale-a-bration set from SU Botanical Blooms stamped in Moss, Amethyst, Banana, Pirouette Pink. Mellow Moss cardstock was stamped with Mellow Moss ink (stamped off once for a lighter effect),with Pirouette Pink card base, matching ribbons of moss taffeta and wide grosgrain, and Pretties Kit pearls. Pillow Box in confetti white stamped with A Rose Is A Rose in Pirouette Pink, Regal Rose, Riding Hood Red, Certainly Celery. Pink satin ribbon to finish. Box is filled with Hershey Kisses. Can be used for birthday, anniversary or valentine. 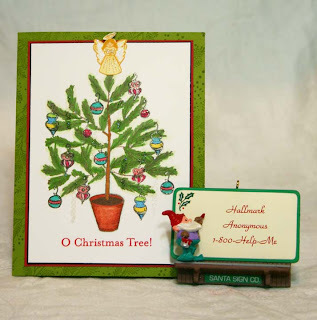 O Christmas Tree is by Flourishes, colored in Copics. Icicles are embossed in Iridescent Ice (a little hard to see in pic). Star Dust Stickles added here and there along with a Sakura stardust gel pen. Pirouette Pink with retired SU paper and new hostess set Dream A Little. Ribbon by Chatterbox. 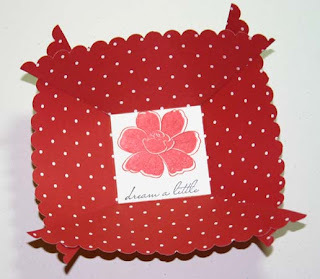 Both projects use the Stampin' Up Big Shot dies- the Baskets and Blooms and the Small Pillow Box along with the Riding Hood Red designer series paper patterns. For the basket I used the hearts from Simply Said along with the heart from the new upcoming level 2 hostess set A Little Somethin'. I also used 3 silver eyelets along each side seam and wove the taffeta red ribbon through the center ones and made a bow. The little pillow box came together in a snap. Filled with candy and tied with linen thread and added Iridescent Ice embossed hearts punched from A Little Somethin' heart and added pearl. Money saving tip: I scour through the after Christmas decorations to scoop up all of the red things that I can find and use them for Valentine's Day. By now (if there's anything left) it is marked down to 70% off at least. This is where I got the red crimped filler and I also got some clear bags, red wrapping and ribbon. 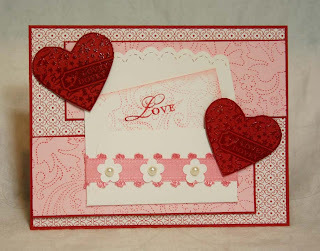 A cross between a Valentine and a tile (it's only on cardstock though), this went together pretty quickly with the help of a stamp-a-majig. I made a similar one to this last year in dark blue and it looks like a Pennsylvania Dutch tile. I'll probably do some more of these in shades of pink and reds for Valentines. All stamps are from the Always set in Riding Hood Red with a brass build a brad. For this tri-fold I used textured Very Vanilla cardstock cut at 8 1/4" x 5 1/2" divided into thirds, scored at about 2 3/4" on both sides. Front piece was punched with scallop square. Middle fold is punched with 1 3/8" square punch. I made a pencil mark so I could center it evenly. Image is stamped on very center, sentiment stamped in middle. I left the very inside blank but for the flower image and will stamp a nice verse depending on the occasion. I clear embossed Bella Toile on outside and added some paper piercing. 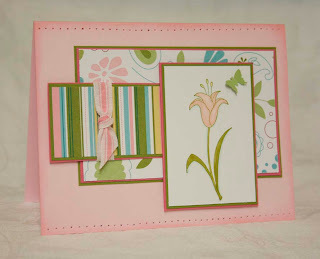 Stamped two-step flower using Pixie Pink for flower and celery for stem with markers. Flower center is Regal Rose. 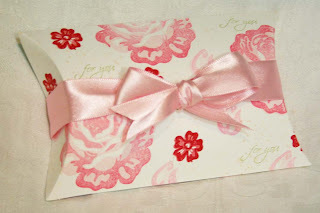 Pink grosgrain ribbon tied in a bow but not too tightly so this can slip on and off your card easily to open. I loved the spring colors in the card on the cover of the new SU catalog. I cased one of the cards with a few changes. I used Time Well Spent but will get the new set that is similar to this, it's really cool. Colors I used are Lavender Lace, Barely Banana, and Pirouette Pink. Colored in markers. I changed the label to Punches Three. 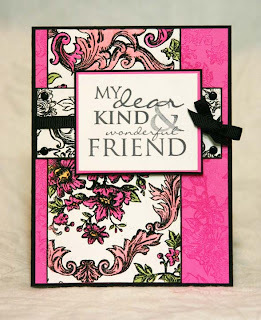 This is also for our Doubledog Dare Challenge this week hosted by Charlene (lilluvsstampin) to use our punches but no designer paper. We would love to invite everyone to join us in the Doubledog Dare Challenges (or DDC) hosted and posted each Tuesday. There are 9 challenge hostesses- Julia (artystamper), Anne (jdmommy), Beverly (beestamper), Anne (it'sapassion), Joan Ervin, Michelle (sf9erfan), Charlene (lilluvsstampin), Francie G., and myself. We will try to get all of the necessary info out to you either on our SCS posts or our blogs. Post to SCS and use the keyword DDC so we can find and comment on your creations. Welcome and have fun with it! New level 2 hostess set from SU is made for coordinating SU punches. They will have the heart that goes with this stamp available on the 19th. Embossed heart in clear on Riding Hood Red and used RHR designer patterned paper with some Pirouette Pink that was stamped in red. 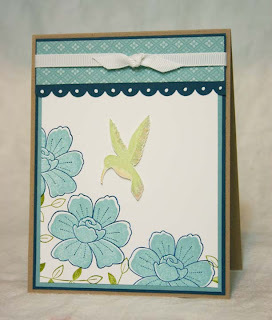 Scallop envelope die by Sizzix (SU exclusive) with a little love letter tucked inside. This is a sneak peek of a level 3 hostess set coming out shortly with the new catalog. It is an 8 piece floral set, one is a sentiment that says dream a little. For the hummingbird I inked it in Celery and markered certain areas with yellow, pink, bashful blue, and amethyst. This is for today's technique challenge over on SCS to make an origami box. The finished size is about 5" square. The template for the box fold can be found under TLC203 and a great step by step tutorial can be found in the Resources section under Origami Box. I used the retired Carte Postale used with matching designer paper (can't remember name). I made a few measurement mistakes so I'll have to try this again. White satin ribbon with Pretties Kit stick pin and Top Note die. Pale and Perfect Plum cardstocks and inks. 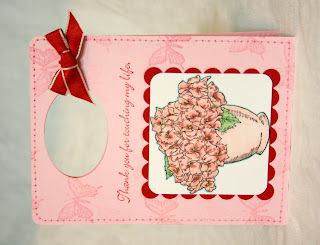 Card base is Rose Red with Old Olive and Pirouette Pink. I tried to pick up the colors that are in the Rasbverry Tart paper that the pocket heart was made from. 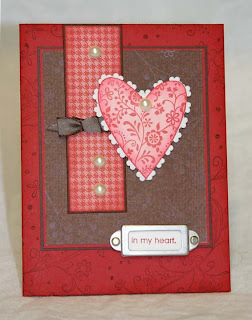 (The template for this heart can be found on Splitcoaststampers under TLC50). I stamped the Wild Hearts background in Versamark and embossed in clear. 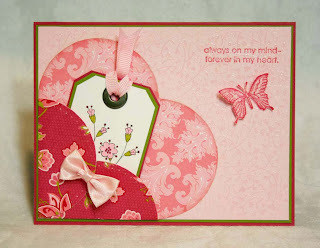 Sentiment in Rose from Always, butterfly from dreams du Jour. Sweet Stems images colored in markers and made into a tag/bookmark with a jumbo eyelet and ribbon added. Pink satin bow is from my stash of unmarked embellishments. 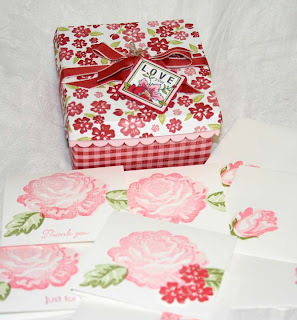 The 3"x3" love notes are on Whisper White cardstock which looks very pretty with this particular rose stamped on it in Pirouette Pink and Pretty in Pink that was rolled on edges in Regal Rose. Leaves are Celery and Old Olive with envelopes to match. 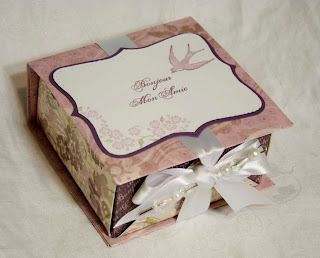 The box was made with the Bella Rose paper, Riding Hood Red taffeta ribbon and linen thread with the image from Dreams du Jour. The bear's been into the honey pot today. Colored image in markers, added Crystal Effects to honey. Paper is Patterns Pack in mustard, added stars in Ruby Red for challenge and some taffeta ribbon. Hope he makes you smile! Day 4 of Valentine week! Card base is Pirouette Pink, matted with Basic Black then Whisper White which was stamped with Sprinkles hearts in Pirouette Pink. Jumbo wheel See You Around was wheeled onto pink panel. 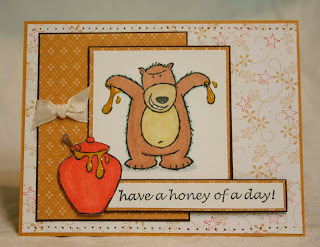 Short & Sweet sentiment combined with "honey" from Just Buzzin' By. Image colored in markers with Dazzling Diamonds added to wings. 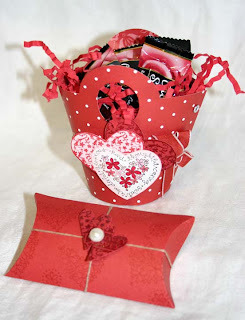 This is a challenge I am doing with a few friends to create a Valentine with something we already own from the current catalog. You would be totally amazed at how many stamps you could use to do double duty for a Valentine/love-friendship card. I came up with 30 different images and sentiments that will work for this with the sets that I already own. Look at your catty just one more time before the new one comes in and see what you can find! 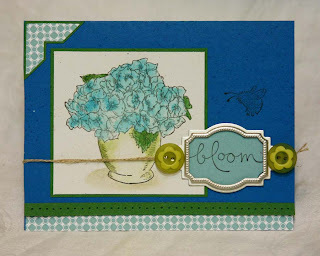 I combined this with our weekly Doubledog Dare challenge this week hosted by Francie G. to use 3 shades of the same color. I made my own designer paper by stamping (and stamping off) stamps from the Always set in Riding Hood Red and Pirouette Pink. 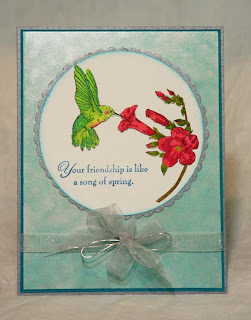 I embossed the entire thing in clear embossing powder using the Floral background stamp. 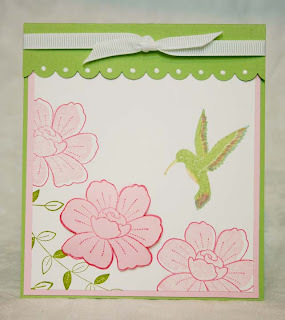 Bird was stamped in RHR and kissed with small flower stamp, masked off bird and stamped heart over top in pink. 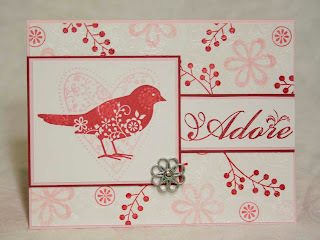 Adore sentiment was singled out from the Tres Chic background stamp in Ruby Red. Filigree brad for embellishing. The color combination today was very difficult for me, Brilliant Blue, Pumpkin Pie, and Garden Green. Truly 3 colors I almost never use, particularly the Brilliant Blue. These colors were in the retired Jersey Shore paper so I went with that as my starting point to make it a little easier. The monkey was colored in the Pumpkin Pie with aquapainter and ink pad and then paper pieced and cut out. I also used the Bold Brights buttons which will be retiring at the end of this catalog and some linen thread. Top Note die used for main image panel. My challenge that I will be doing with a few friends this week is to find creative ways to make Valentines with the sets that are available in the current SU catalog. Terrifically Tacky adhesive strips with white, pink, and burgundy glitter, stamped between rows with Crafty Secrets swirl in Pretty In Pink. 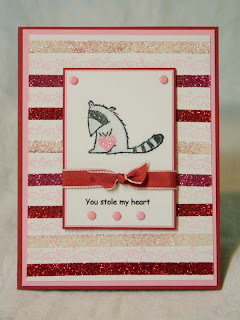 I computer generated the sentiment to go with the raccoon bandit with the punched out heart covered in glitter. Riding Hood Red taffeta ribbon and Soft Subtles pink brads also added. 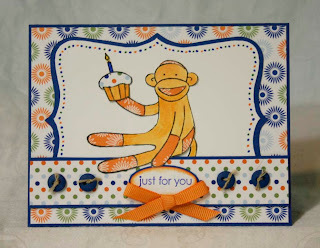 This card is for today's Featured Stamper challenge on SCS featuring the one and only Julie Ebersole, a.k.a. Her Royal Rubberness. She is one of the sweetest people in the world and a very talented lady as well. I've always loved Julie's style, she is one in a million. I changed the heart to Always and the background stamp from Floral to Bella Toile. I didn't have any of that pretty mulberry paper so I just used my scallop scissors to outline the heart. Build-a-brad used in place of the pearl. Congratulations, Julie!! Enjoy your day, you have always been an inspiration to me!! Raspberry Tart d.s.p. with Pretty In Pink and Rose Red. 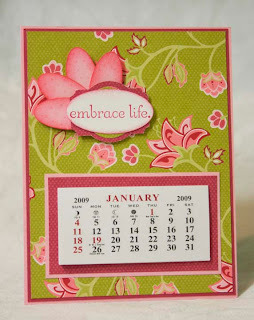 Mini calendars from Impress. I tried to make a bloom like the ones found in the paper with the small oval punch, along with the designer label and large oval punch. Magnet strips are on back so this will go on the fridge. I didn't have a New Year's sentiment that I could find easily so I thought this Best Yet one would work to wish a Happy New Year. 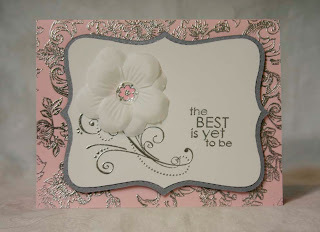 Embossed Bella Toile background, sentiment, Sweet Stems flower, and Priceless swirl in silver. Top Note in Brushed Silver and Whisper White along with Pretties Kit silk flowers and build-a-brad acrylic circle for flower center.